Although Orlando, Florida has become synonymous with all things Disney, there are actually a lot of other vacation-worthy places to visit here. 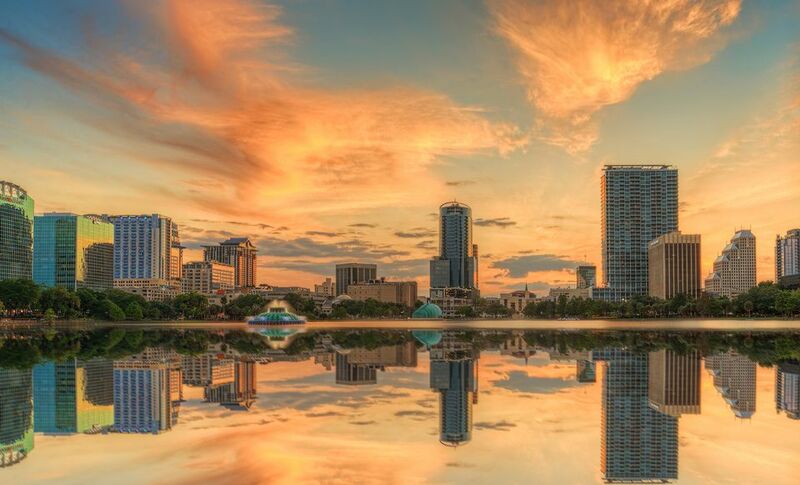 You can head here to explore the city itself, or add some of these Orlando activities onto your Disney vacation to split up your days between the theme park and the local sights. This outdoor park offers guests an up close and personal look at all different types of alligators, crocodiles, wild cats, birds, snakes, and turtles. Gatorland is home to the country’s largest collection of white gators, including the famous Bone Crusher, the largest living American crocodile. It's also home to Neiko and Lucy, two Florida Panthers brought in to help educate guests about their species. The park offers other activities as well, like zip lining and nighttime gator tours. SeaWorld is a great combination of theme park and aquarium. There are a manageable number of rides and attractions, so you won’t feel that same pressure to do it all as fast as you can. They also have a wide variety of attractions which makes this park fun for all ages. Older kids will love their newest ride, Infinity Falls, which takes guest soaring down speedy rapids leaving you soaked. Younger guests will enjoy Happy Harbor, a kiddie zone filled with family-friendly rides. Of course, you can’t visit SeaWorld without checking out any of their animal shows—Dolphin Days, Ocean Discovery, and Pets Ahoy are some of the classics. Owned by SeaWorld, Discovery Cove is another great place for family fun. Discovery Cove is not your typical theme park. Once inside, visitors can swim with dolphins, snorkel with exotic fish, or feed tropical birds. The idea is to immerse yourself in nature with hands-on experiences you can’t find anywhere else. There is also a beachfront bay for swimming and a soothing river with controlled currents. You can spend the day relaxing by the water or enjoying the activities. Located about an hour south of Orlando is a land built of plastic bricks that's inhabited by square-shaped people with plastic hair. LegoLand is a vacation in and of itself. With two Lego-themed hotels, dry and water rides, and shows and dining, you could spend a few nights here. LegoLand is family-friendly and affordable with ticket and hotel packages starting at only $150 a night. The International Drive Resort area in Orlando is home to many family-friendly attractions that are all within walking distance of each other. It’s a great place to stroll around in the evening or hang out during the day. One big attraction on I-Drive is the SeaLife Aquarium, home to exotic fish, sharks, sea turtles, and jellyfish, giving visitors a unique perspective on how the undersea eco-system truly works. SeaLife Aquarium has Florida’s only 360-degree viewing tunnel where you can walk through the ocean without getting wet. Experience the Orlando skyline like never before by hopping on the 400-foot high observation wheel, ICON Orlando. Located in the popular I-Drive resort area, ICON Orlando is anything but your average Ferris Wheel. Instead, ICON Orlando ups the game with 30 fully enclosed air-conditioned capsules that transport you above the clouds and provide 360-degree views of the city. Day or night, this is a great activity for the whole family. Attached to Orlando’s Florida Mall is an attraction your kids will absolutely love: the Crayola Experience. This is not just a craft store, the Crayola Experience is a place where kids can create crayon jewelry, make melted crayon artwork, snap a photo with the world’s largest crayon, create a coloring page portrait of yourself, or bring your digital designs to life. There are interactive color shows and of course a massive selection of crayons you can buy. If you’re traveling with younger kids and need to pass the time for a few hours, they will love this place! This indoor amusement park museum is one interesting place. For starters, WonderWorks is upside down, so the ceiling is the floor. Kids of all ages will love the thrills like laser tag, ropes challenge, and a simulator ride. Hands-on exhibits about space, weather, and light and sound are both educational and fun. Spend the day or a few hours, either way, WonderWorks is a must! For all you history buffs, this exhibit is for you. Located on I-Drive, Titanic: The Artifact Exhibition will transport you back 100 years to the time of the Titanic. Seventeen museum galleries, full-scale replicas of parts of the ship, and “Little Big Piece,” part of the ship’s hull, make this immersive experience worthwhile. On Friday and Saturday nights the museum holds a Titanic Gala Dinner where visitors are first class guests of the ship celebrating with friends on the infamous day, April 14th. The gala includes a tour of the museum, an actual Titanic menu dinner, and a re-enactment of the events on that night. It’s loud, and it’s noisy, but there’s no other way to experience the Central Florida Everglades than by an airboat, and Boggy Creek is the best in the business. Choose from one of their many tour options which include private tours, night tours, or rent your own airboat, and set off onto the river looking for alligators, birds, and turtles. While you’re waiting for your tour visit the Native American village or the gemstone and fossil mine, there is a restaurant and tiki bar on site as well. The Winter Park Boat Tour is a great activity for those looking to enjoy a tranquil afternoon on the river. Located about 10-minutes from downtown Orlando, Winter Park Boat Tours take visitors down Lake Osceola, while enjoying all of the beautiful nature that surrounds them. Tour-goers have been known to spot cranes, alligators, and some beautiful swaying palms. This unique theme park is meant to transport guests back in time to ancient Jerusalem. Stop by the Tabernacle to witness a service by the high priest, Aharon, and his sons. Or head to the Scriptorium for factual insight and artifacts from ancient Israel. The park is filled with educational and interactive shows that will truly elevate your soul. Forever Florida is truly a one-of-a-kind experience. Set in the middle of the Florida wilderness, this nature park offers guests some of the coolest activities around like, a two and half hour zip lining adventure above the trees, or a horseback riding trail through unchartered terrain. You can even camp out here, too. The preserve offers cabin rentals, bunkhouse or tent-style camping. This is great for those looking for an outdoors adventure, but it’s probably better for older kids. Don’t be disappointed if it rains over your Orlando vacation because the Orlando Science Center is the perfect activity. This museum is full of exhibits that will ignite your curiosity and activate our senses. From live animal shows to dinosaur safaris to cutting-edge science demonstrations, the Orlando Science Center is a great way to spend the day, no matter the weather! The Safari Wilderness Ranch will transport you to the African savannah. Visitors can enjoy an open-sided jeep safari, or kayak through the man-made lake. The ranch also offers sunset safaris and camel-back expeditions. You’ll see zebras, water buffalo, kudu, and so many more safari animal staples. This is the closest experience to an actual safari in the entire state! Consider CityWalk the downtown of Universal Studios. This outdoor shopping area is filled with great stores, restaurants, live entertainment, and fun bars. It’s a great place to go out with friends or the entire family. There is a rotating concert schedule during peak season so be sure to check who will be in the area when you’re planning to be. Another great way to enjoy Orlando without doing the Disney thing is to stay at a waterpark hotel, like the Westgate Town Center Resort in Kissimmee. Shipwreck Island Water Park is located at the resort, but non-resort guests can enter the park too, for a small admission fee. It’s not a big park, but if you’re traveling with younger kids it’s a manageable place where everyone will have fun. A restaurant, Jolly Rogers Galley, is open daily to park guests. About 10-minutes from Disney World lies the other big attraction Orlando is known for, Universal Studios. Universal has so much to offer, you can technically spend your entire trip to Orlando exploring it all. After all, Universal is home to the world-famous Wizarding World of Harry Potter, Jurassic Park River ride, and Spiderman ride, so there is plenty to do. Universal’s other parks, Islands of Adventure and the water park Volcano Bay, are right nearby and offer guests thrills and fun that never disappoints. If you’ve got a sweet tooth, then the World of Chocolate Museum is for you. Learn about the history of chocolate from around the world, and tour over 25 chocolate sculptures of famous landmarks and people. Of course, there is chocolate making and tasting, too, which will make the trip here completely worth it. About an hour east of Orlando is the famous Kennedy Space Center in Cape Canaveral. Although they’re not always launching rockets (check their website to find out when they are), the Kennedy Space Center is still a pretty cool place to visit. Learn about NASA’s early space programs, and find out what they’re planning for the future on a guided tour. You can make a day out of Cape Canaveral—after the space center, head to Playalinda Beach, which is right down the road. The famous wax museum full of today’s hottest celebrities and characters will make the best photo-ops and memories from your Orlando retreat. Madame Tussauds Orlando recently unveiled the Justice League Heroes so you can get your selfie’s with Wonder Woman, Superman, and Batman. Other lifelike stars you’ll meet are Selena Gomez, Will Smith, and Albert Einstein. We couldn’t talk about all that Orlando has to offer without at least mentioning Disney World. Of course, Disney is a world in and of itself comprised of multiple theme parks, water parks, and resort experiences. It's definitely a worthwhile trip to take, but if you are traveling with younger kids, it may be a better idea to limit yourself to one or two parks. Magic Kingdom and Animal Kingdom are both great for little children.